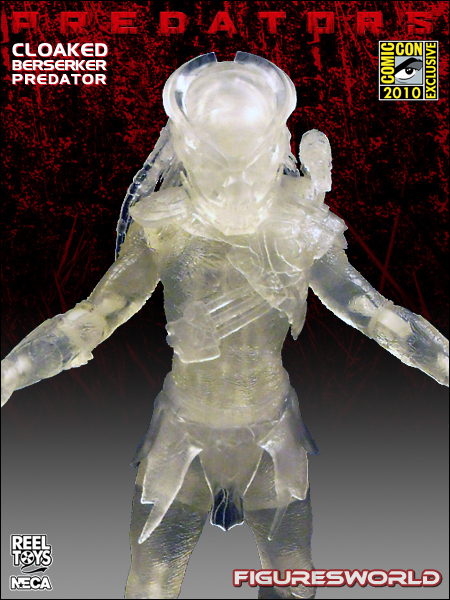 This highly detailed and fully articulated action figure of the Cloaked Berserker Predator from the 2010 Predators movie is limited to 2000 pieces. Stands almost 8 inches tall and comes with accessories in a blister packaging. San Diego Comic Con 2010 Exclusive! In the first Predator-only Predator movie in 20 years, a group of elite warriors are hunted by members of a merciless alien race known as Predators on a distant and foreboding planet. Kidnapped against their will and hunted by an all-new pack of vicious Predators, it's kill or be killed for this fearsome crew. Predators named in the fashion of the Aliens series and starring Adrien Brody and Laurence Fishburne, among others.